The figurative Wayback Machine, I mean (i.e. my memory), since I don’t know how to use the actual Wayback Machine and find any real evidence that any of the below actually happened. My first vivid memory of Bud Selig is from 1998. Of course I’d been aware of him for a long time before that, first as owner of the Milwaukee Brewers, then Interim Commissioner, then Commissioner. Selig took a lot of heat for announcing the cancellation of the ’94 World Series, but what was he supposed to do? It’s not as if he had any real power; it was his employers and Donald Fehr who were calling the shots. Fast-forward to 1998. I’m in St. Louis to cover Mark McGwire’s (and Sammy Sosa’s!) pursuit of Roger Maris. If you weren’t watching baseball that summer, you might not believe this, but everybody thought McGwire and Sosa were basically the greatest things in Baseball since protective cups. It seems nobody dreamed those guys were up to their gills in steroids, etc. Not that I can really say anything. I don’t remember what (if anything) I was thinking about drugs, but I was pretty thrilled about getting sent to St. Louis to sit in the stands and enjoy the biggest story we’d seen in a long time. McGwire hit his 60th homer on the 5th of September, so there was absolutely no doubt about if, but rather when he would catch and pass Maris. I was in Busch Stadium when he caught him, and again the next night when he passed him. All I remember about that night are 1) a sweet Cardinals fan giving me a small troll doll, 2) McGwire’s record-breaker just sneaking over the fence down the left-field line; I believe it was his shortest homer of the whole season; and 3) Commissioner Bud Selig commandeering the field after the game and literally sucking the life out of things with yet another of his terrible speeches. OK, not literally. But just the fact that I’ve used “literally” incorrectly says something about the impression Selig made on me that night. I know this wasn’t the only thing I wrote about that night. But on a night when I should have been focused solely on McGwire and his signature moment, I was instead writing about Selig. Which I think set the tone for my future writings about him. What sort of person, I wondered, so utterly lacks the self-awareness and humility that would allow him to just get the hell out of the way when a big moment arrives? What sort of person really believes the fans want to listen to him at such a moment? Impressions are a powerful thing, and I don’t know that I ever quite got over Selig’s Busch Stadium performance. So his position as Major League Baseball’s top spokesman was a double whammy: Selig was a lousy, enervating public speaker and his job apparently compelled him to say disagreeable things. In the winter of 2001-2002, with MLB and the Players Association locked in another labor battle, the Commissioner said many times that unless the players agreed to some of the owners’ more Draconian proposals, then of course a couple of franchises – specifically, the Twins and the Expos – must simply cease to exist. Not coincidentally, this would also cost the union 80-some members (everyone on 40-man rosters). Which is to say, this was a fairly naked negotiating tactic, so naked that the union shouldn’t (and probably didn’t) take Selig’s threat seriously. Oh, and MLB was also angling for a couple of shiny new citizen-financed ballparks. I wrote about this often, because I was offended that the commissioner of my favorite sport was (I believed) lying to me, and also because I thought the commissioner’s threats were unfair to fans of the threatened franchises; granted, Twins owner Carl Pohlad actually seemed enthusiastic about losing his club, maybe because he knew it would never actually happen; best-case, of course, one of the richest men in America would get a shiny new, largely citizen-financed stadium (which of course is exactly what happened, so bully for billionaires). Of course I could have picked up while Selig was talking, but I wanted a chance to sit down at my desk and prepare myself for what promised to be … an interesting tête-à-tête. The next morning, sitting at my desk and armed with a few questions about baseball’s finances and the contraction mess, I dialed the number. Selig’s secretary connected me straightaway. I hoped, because I’m terribly polite except when I’m writing, for a perfectly polite conversation with this historic figure. It wasn’t really so polite. Selig clearly had a print-out of my ESPN.com column at hand, probably with the offending passages highlighted by a flunky. And he spent the next half-hour or so simply going through the passages, and telling me exactly how I’d gotten each one so horribly wrong. A few times, I tried to interject with my questions. He wasn’t having any of it, not even a little. I think it’s probably safe to say that Selig didn’t respond, or really react at all, to a single thing I said. He was the High Commissioner of Baseball, Lord of Lords, and I was nothing. When finally he’d finished haranguing me, I believe he did sign off civilly. But it’s certainly the most frustrating conversation in my professional life, to this day. And I probably was less well-disposed toward Selig than I’d been before. I probably became even less well-disposed a few weeks later, when the word came down from above: Lay off Commissioner Bud. Oh, I wasn’t told I couldn’t criticize him. Just that I couldn’t do it with such obvious relish. Still, seemed petty at the time (and still does). I wasn’t the only one, either. I know other writers who’d gotten calls from Selig, and I know other writers who’d been told by their bosses to take it easy on the poor old Commissioner. In the years since, with everyone making big piles of loot, our poor old Commissioner generally avoided the temptation to cry poor. Oh, there was that brief little flurry of talk about contraction (again?) four years ago, but Selig never became the face of that silly trial balloon. And even if he had gone public, what of it? Of course that wound up being a tremendous investment, at least for the investors who stuck around for three or four decades. 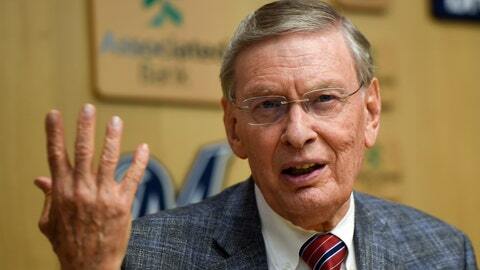 But for Selig, one suspects his favorite rewards have not been financial, but rather personal. After fighting for respect in Major League Baseball’s smallest market, he eventually sat at the head of the table for more than 20 years. The baseball business is as healthy as ever, and now ex-Commissioner Bud gets to ride off into the sunset, a healthy sinecure in hand. One suspects that we’ll see a memoir in two or three years, because Selig doesn’t seem the sort who can resist the temptation to burnish his legacy. It’s just a shame that he almost certainly won’t write a single thing that might seem less than loyal to the men who let him join, and then run the meetings of, their exclusive little club.